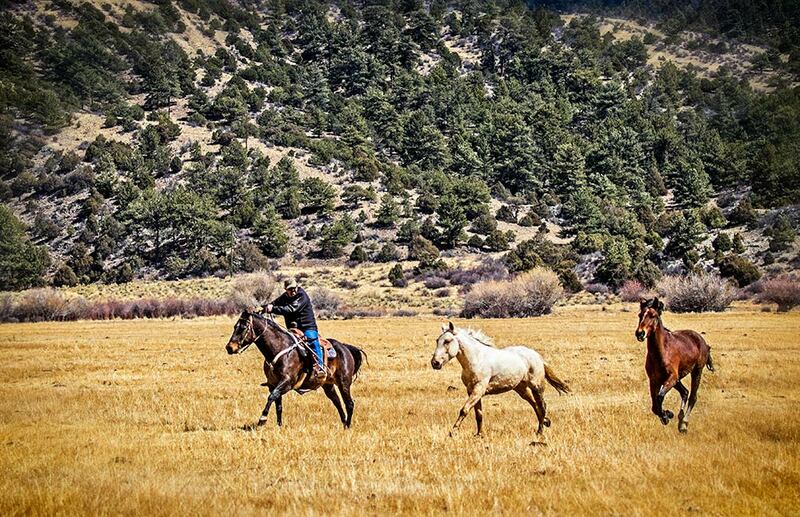 Our adventure with wild horses began several years ago, in a time when I had no interest in horses whatsoever. I thought they were the most boring animals ever, always standing with their head down in a fenced pasture. They looked bored and they were boring to look at. At that time I had no idea that a horse is in fact the symbol of freedom, strength and endurance. All I knew was tame, boring domesticated horses that hardly ever moved a foot. To me, wild horses only existed in movies, but certainly not in the real world…. When Renate came into my life, we took little trips into the countryside of Belgium where we lived at the time. We enjoyed the refreshing wind, the flowers in the fields, the shapeshifting clouds and the animals around us. Except for the horses. They looked as boring as ever to me… Until ome day Renate stopped and called one. Suddenly something interesting happened…. A horse came up to her… and I heard Renate talk to it with a voice so loving and tender like I had never heard before. And the horse responded. She touched it gently and my wife looked like she was in love with this animal. This beautiful image is for sale as a stunning canvas print. Order it here. ‘Wow… the horses have feelings!’, I realized for the first time in my life. They are sensitive. And… they are indeed alive! They could do more than just stand there in those pastures, eating grass. 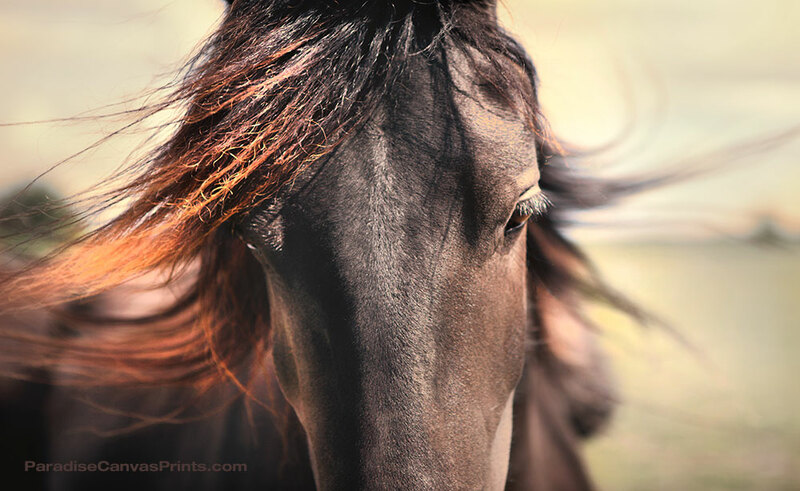 The way Renate approached horses and how they responded, awakened something inside of me. We did this several times and after a while I began touching the horses as well. That sent something unfamiliar through my veins, straight into my heart. I was surprised at the sensation I felt. How wonderful to touch the muzzle of a horse! It’s so soft… and those big eyes look so tenderly at you. My heart began opening up for a whole new approach to these large animals and I started seeing that they are in fact beautiful. How they move, the way they look, the wind blowing in their manes, and their hoofs pounding the ground when they run. Now of course, these weren’t wild horses yet. It were just nice, tame, domesticated horses, the kind that fill the pastures in our developed world. But… little did I know these tame horses would become the first stepping stones in my life towards riding a wild mustang horse… in a not so distant future! Suddenly Renate challenged me: ‘David why don’t you take some riding lessons?’ She might just as well have asked me: ‘Why don’t you go on a cruise to the moon?’ Nothing could be further from my mind. Me, taking riding lessons? Ugh… But as with all new things that purposely cross our life path: after fighting it for a while, it slowly started creeping into my heart, like a leaking pipe that drips water into your basement. I started getting wet…. 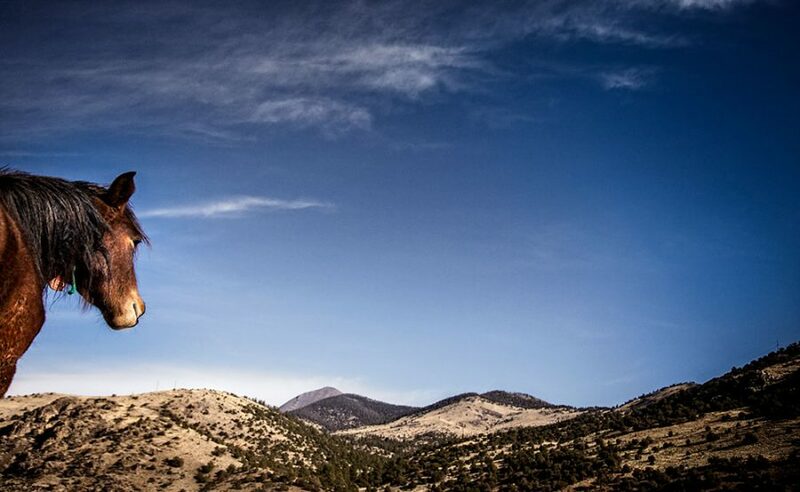 with an appetite for adventure. Well, why wouldn’t I try it? The first day I entered the riding arena, I looked up at the massive horse, that towered above me… making me feel like a fool. Why would I be so mad to get on such a big beast? The instructor insisted this monster was the calmest and safest horse they had. I found it ridiculous. Why would anyone want to put a complete novice on the back of such a huuuuge horse? But I had no choice. I had signed up and there I went, with the help of two hands under my foot, on the horse. Before I knew it, I was sitting high up in the air, on a tremendous amount of muscle and bone underneath me. It was an unforgettable sensation, feeling such a big living mass between my legs. I had ridden motorbikes before, which is pretty cool. But this was not a machine. This thing was ALIVE! I heeded the advice to relax and breath slowly and there I went, on this amazing living machine that started moving slowly around the arena. And you know what? I actually loved it! I loved it so much…. Wow, this really was something! The weeks went by and my muscles didn’t hurt as much as after the first few rides and before I realized it, we suddenly had bought our own horse: a very sweet full blooded Arabian mare. She was the most peaceful living creature I had ever been around. Her entire body oozed peace and comfort. People told us Arabs were living fire, but she wasn’t. She was so relaxed and forgiving. It seemed she loved us from the day she saw our kids crawling underneath her belly. This loving horse was my first step into the real life with horses. I took her to a nature reserve in the Netherlands, called the Veluwe: tens of thousands of acres where I could ride freely. It was the trill of my life. After trotting a bit through the woods and heathlands, suddenly another world opened up before me. The famous sand drifts of the Veluwe, that look like a piece of Southern Arabia in the heart of the Netherlands, invited me and my horse. I gently urged her in a gallop and as we moved into the wide open sand dunes, she started racing. The sand softened the pounding of her powerful hoofs, and I had to gasp for air, in the wind that blew my hat off. Together we were storming forward, and I don’t know who enjoyed it more, the horse or me. While enjoying it like crazy, I also had to hang on for dear life, because I had never raced on a horse like this before. It was just happening and I let it happen. She felt like a steam locomotive, such a blast of power exploding underneath me. Her breathing was regular and energetic… But my muscles couldn’t cope with it. Everything started hurting, so I calmed her down and led her to a trot and then a walk. For the next half hour we gently walked through this beautiful piece of heaven on earth, a nature reserve without any elements of human madness. No ugly electricity poles or stone buildings that destroy the spectacular natural beauty. I don’t know why, but for some reason anything man builds is always annoying, but anything nature brings forth is always beautiful. This very first ride in wide open nature did something in my innermost being, that transformed me forever. Although most of my live I couldn’t care less about horses, this day I felt deep inside of me: ‘This is what I was born for. Horses! This is my destiny…’ I felt happier than I had been for many years. While the sun was setting, and a golden light casted a dreamy glow on the landscape, we headed back home, never to be the same again. Riding wild horses in America? Are you nuts? The following months we however discovered how structured the tiny nation of the Netherlands actually is. I got chased by rangers more than once, and learned the strict rule to never leave the horse trail (yes, even if you have no idea if your still are on a horse trail or not, just don’t leave it) or you’ll get a huge fine. 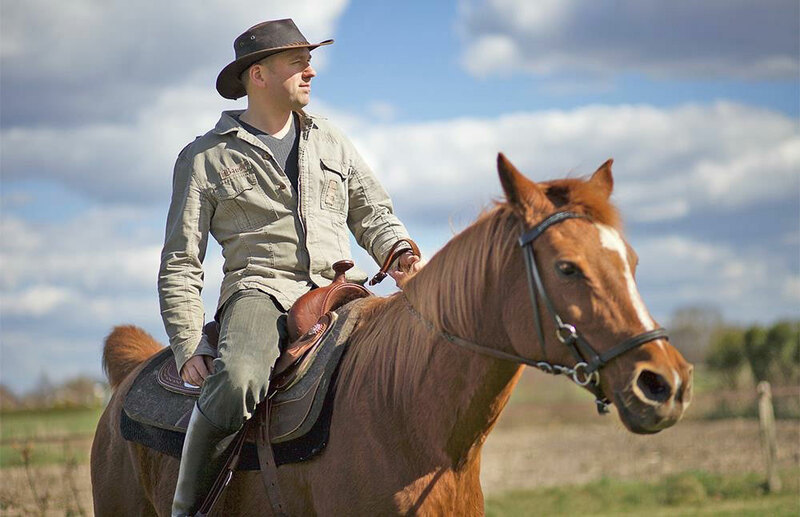 Both Renate and I started discerning a desire in our heart to to ride more freely in more wide open country. Renate spent hours watching horse movies and she dreamed away during the breathtaking scenes of wild horses running free in endless open spaces of the west. Three years later we packed our bags and stepped on an airplane, headed to America. 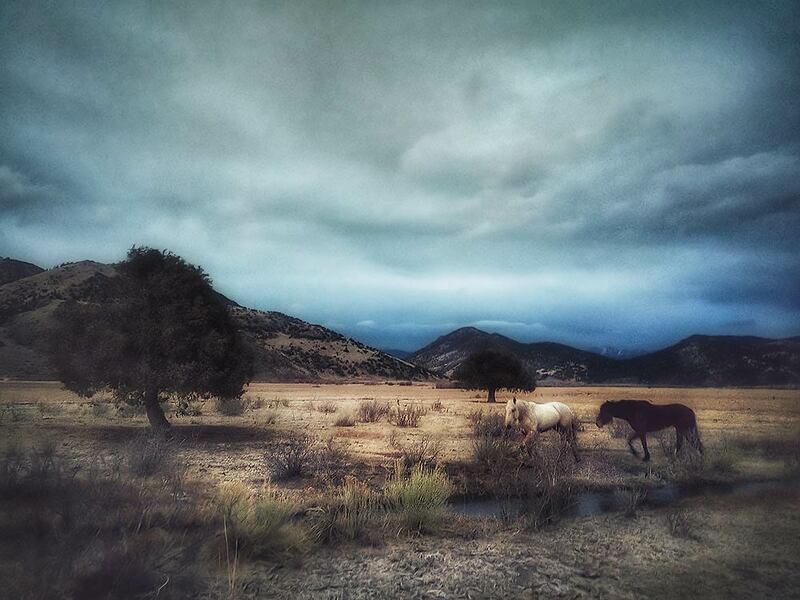 Now we live in the heart of Colorado, and we have adopted two wild horses! 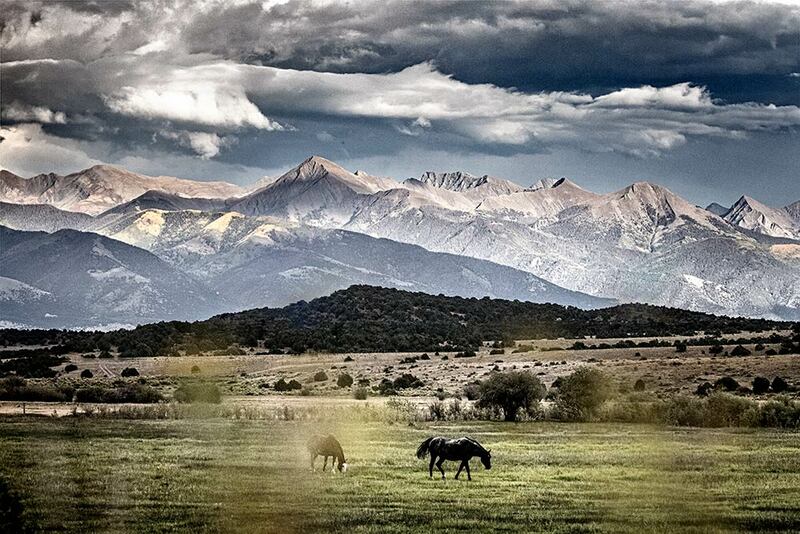 Wow… Surrounded by mountains, we rent a house with 30 acres and a pasture for horses. That was utterly impossible. Especially with our limited budget. Yet we are here. God did not one, not two, but a whole series of miracles to get us where He wanted us to be. Yes, I know… some who read this don’t believe in God. That’s fine. But we do and we owe it all to Him and Him alone. He made it possible for us to get green cards for the whole family and now we live in a place we couldn’t have imagined in our wildest dreams. It’s absolutely amazing. Our wild horses arrived… and escaped! A few days ago a dream came true: a huge horse trailer backed up on our property and two gorgeous wild mustang horses stepped out. Two days later… they were gone. Galloping on the road, they left us behind, with our hearts virtually standing still… shocked. There they go! On the road… towards the highway. What happened? Did they bust out? Are they truly THAT wild, that they broke through our super strong fences? What happened? I don’t know. But they are gone, running loose. I jumped in my car and raced over the properties of my neighbors, trying to catch up to them, but they started galloping even faster! I couldn’t drive through fences, so I had to turn to the road as well. Praying, trying to breath and thinking hard, I finally managed to pass them on the road, and turn the car, forcing them to turn back. But they wouldn’t go back on our road, they took a turn and headed straight for the wilderness… where they would have millions of acres at their disposal, to run free for the rest of their lives. Wild and free, as they used to be. ‘Lord, send an angel and stop these wild horses!’ I cried out loud. Yes, I know it sounds silly, but honestly that’s what I did. I had just bought thousands of feet of white fencing, and slowly me and my kids started putting up a fence around the horses. To my surprise they kept standing still. We wrestled our way through thick willow bushes, plunged through marshy ground and got scratched all over from the thorns, but after two hours of hard work we had created a fence around the wild mustangs! They looked at us curiously, and suddenly the leading mare realized they had been tricked. She trotted nervously from one side to the other, seeking a way out. I hoped with all my heart that our silly, futile fence, that had no strength whatsoever to withstand even the slightest pressure from a horse, would have the required psychological effect. It was nothing more than a visual barrier. But it worked! After a few stressful days, with my emotions going crazy about the loss of our long awaited wild horses, we were able to bring them back home. ‘Now we really have caught our own wild mustangs in the wild’, I chuckled. Now the next challenge begins…. 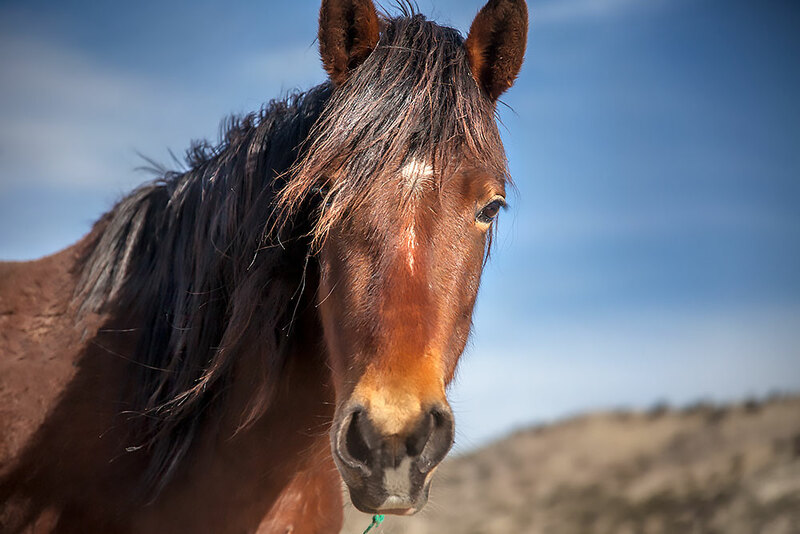 How on earth do you gain the trust of a wild horse, that has never trusted humans before? Some call us stupid for adopting wild mustangs. I have to agree with them. We are stupid. But we are stupid with a big heart for animals and we love them so much…. We can’t help ourselves. Renate bought a documentary called ‘Wild Horse, Wild Ride’. This film follows several experienced and unexperienced people who adopt a wild mustang and train it in 100 days. After 100 days there is a nation wide competition – the Extreme Mustang Makeover – where the trainers show off what they have been able to do with a wild horse in these three months. This documentary had a tremendous impact on us. How would it be, to become the very first human who gains the trust of a completely wild horse and become friends for life? This romantic picture just grabbed our hearts and no matter how hard we tried, we couldn’t shake it off. Good advice from seasoned horse trainers made us doubt for a few minutes, but the voice in our hearts won the fight. Sitting down with wild horses? So… we started training our wild horses. This is an amazing experience. I have no idea how to explain this… At the moment I am so excited about what is happening. Actually, we had no idea what to do, when they arrived. So I sat down with them. What? You sat down, with wild horses? Uh… yes. I am sorry. I guess it wasn’t very wise. But it felt like the right thing to do. Show the wild horses I am no threat to them. I just sat down, with my head down, and showed no interest in them. And lo and behold: they came to me, and sniffed at my hat. Is this ‘thing’ here on the ground dangerous? No… OK! And they moved away again. I would not recommend this to anyone else and please don’t see this as ‘expert advice on how to train a wild mustang’. It’s just what my instinct told me and I did it. The horses were calm by the way. I waited till they settled down before I sat down with them. So we did this a few times, and communicated to the horse that we are not after his throat. My kids were able to touch the horses gently at the second day, which is thrilling. I just stood next to the horses, silently, seemingly uninterested, looking at the sky. That aroused their curiosity, so they came closer and sniffed me again. The third day of training I made a bold decision: I will do join up. If you know Monty Roberts the well known horse whisperer, then you know what I am talking about. For those who don’t know join up, I will explain it briefly. Monty Roberts went to Wyoming as a young boy, to catch wild horses. Monty observed the horses and noticed some interesting behavior. When a horse wasn’t behaving properly according to the alpha mare (the leader), the ‘naughty’ horse was sent out of the herd. When he decided to behave nicely, this horse started bowing its head, began licking and chewing with his mouth, and coming closer to the leader, who would then accept him back. Monty realized this is horse language. Bad behavior = get out of the herd. Want to submit and behave properly? Show me by licking and chewing, lowering your head and coming closer. So what did Monty Roberts do? He imitated this behavior when he trained horses. He brought them in a round pen and chased them away. He let the horses run a few circles in both directions, and he waited for the signals of submission. When the horse fixes his ear on him, lowers its head, makes a smaller circle and starts licking and chewing it’s mouth, Monty turns around, and the horse comes to him. The horse joins up with him. It chooses to recognize him as the leader. Anyway, this training method fascinated my family, from the day we read about it. So the third day I made the decision to try it with the wild mustangs. I was very much aware that I could not expect the same quick result, as with a domesticated horse, who has no fear of humans. But I wanted to show my wild horse: I am the leader here and I want you to voluntarily submit to me. So I separated the horses and starts doing join up with one of them. It is important to mention here that in our little herd of two horses, we see that the palomino is obviously the leader. The dark bay horse hides behind her, when we come close, and she follows the yellow horse like a baby follows her mother. I was so smart – or so stupid – to attempt a join up with the dominant horse, the leader of the two. Well.. did it work? Of course not. I was way too unexperienced and I totally misread the signals from her. So that night I was frustrated and upset and afraid that I messed up. Wow, that took some weight off me! I had indeed seen some result with the palomino leader. After running in circles for a good while she did show licking and chewing and came a bit closer. When I turned away and invited her to come t me, she didn’t…. but – and this is the good part – she did turn her body towards me and looked at me. I suddenly realized that was a start. A good start. The next day I did a join up with the bay horse, who is a natural follower. 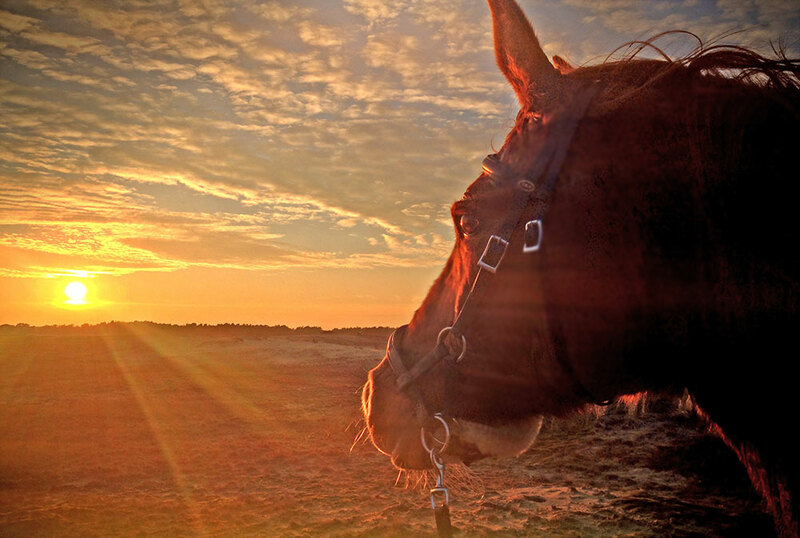 So maybe this horse would be easier, and indeed…. after the required set of circles and the signals of licking and chewing, I stopped, turned around and… she took a few careful steps towards me. No, not a real join up yet, where you can touch the horse. But… she did walk towards me. I realized that is huge for a completely wild horse, who never trusted humans before! I kept working with her, with approach and retreat, and another join up and after a while…. she started following me, all around the round pen. When I turned left, she followed me and when I turn right she followed me, when I stopped she stopped, when I walked on, she came after me. I was exctatic with joy! My wild mustang is following me, on day three of training! Wow… Incredible. On day four I decided to try join up with the dominant horse again. I had gained some experience with the bay horse, so I felt more capable now to try it again with the leader. She is a beautiful strong horse and I enjoy seeing her run. She has a very strong body and the way she moves is amazing. I noticed that her back remains almost level, when she trots, and that’s great. It means I wont bump to all sides once I will ride her. She is pretty smooth. Anyway… I let her run, and it was forever before I saw she sigs of submission. Suddenly she violently turned around, against the direction I was sending her. A clear sign of rebellion! I lifted my hand but she didn’t respond and kept running in the wrong direction. I actually had to jump in front of her, and wave both hands to turn her back. But…. right after this attempt to have her own way and my strong resistance and sending her back in the direction I wanted her to go, she started licking and chewing. She submitted. Very interesting. She tried to break through my leadership, it didn’t work so she submitted immediately. Wen I stopped and turned my back to her, to show her that she could ‘come back’ t me, she took a few steps towards me, but nothing more. But I was content. I learned a lesson: be content with every step of progress, don’t expect perfect result right away. She stepped towards me, which is great! I also know that a wild mustang is struggling inside to trust. The wild horse wants to trust me, that’s why she started licking and chewing. But she is still very afraid and rebellious. I decided to try it again the next day. However, an hour later, I was in for a big surprise. My daughter had been trying the technique of approach and retreat with the palomino, but didn’t get an obvious result yet. I had a feeling I wanted to give it a try as well… And to make a long story short: suddenly the horse started following me, in the corral! What didn’t happen in the round pen, right after the join up, did happen an hour later in the corral. I was just doing some approach and retreat, and then I moved in front of her in arches, from left to right…. inviting her to follow me… and she just started following me. I am very very excited about this progress. Without the join up principle of Monty Roberts this would not have happened. I realize that I have a lot to learn and I am probably not ding the join up as I should. Monty would have the horses following him right away. But I am trying the best I can and I am truly thrilled about the result in this stage.